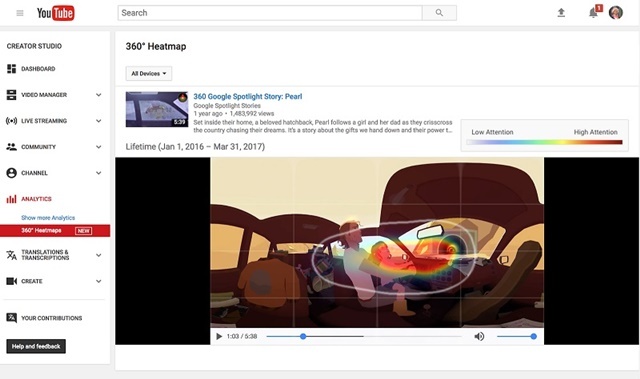 YouTube has announced heatmaps to help for 360-degree and VR videos. The new analytic tools will allow users to take a look at how viewers are interacting with 360-degree and VR videos. The insight for these contents are available only for videos with over 1,000 views. As part of their work in VR, YouTube also shared some research on what makes engaging 360-degree content. Of note, they provide statistics, as well as highlight how users have different behaviors depending on the device, like Cardboard. Focus on what’s in front of you: The defining feature of a 360-degree video is that it allows you to freely look around in any direction, but surprisingly, people spent 75% of their time within the front 90 degrees of a video. So don’t forget to spend significant time on what’s in front of the viewer. Get their attention: While a lot of time is spent focusing on what’s in front, for many of the most popular VR videos, people viewed more of the full 360-degree space with almost 20% of views actually being behind them. The more engaging the full scene is, the more likely viewers will want to explore the full 360-degree view. Try using markers and animations to draw attention to different parts of the scene. Keep different experiences in mind: The context in which people are viewing VR videos matters too. Some might be watching on a mobile and portable Cardboard, while others are watching on a desktop computer. For instance, we found viewers usually need a couple seconds to get situated in Cardboard, which isn’t needed for other devices. So make sure to give your viewers a few seconds before jumping into the action. Youtube also excited to announce that for creators who want to go all in on VR and hone their skills, launching the first ever VR intensive program at YouTube Space LA called the VR Creator Lab.